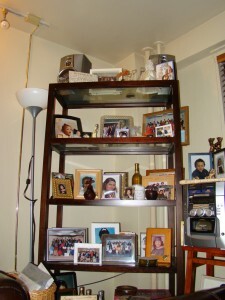 Carolina Quinones Scott, a single mother of four, stood in the ninth-floor lobby of her public housing apartment building in Bedford-Stuyvesant, Brooklyn, and described her neighbors — the family next door is often too loud, and the smell of marijuana wafts over from an apartment down the hall, she said. Scott, 46, lives in an apartment decorated in earth tones with a breathtaking view of the Manhattan skyline and the Brooklyn Bridge. But sitting in her apartment at night, there have been many times Scott has heard gunshots. In August, Andre Young, 28, who lived on the 10th floor, was shot and killed one afternoon. What makes Quinones a paradox in a hostile environment is her warm, genuine smile and hospitality, conjured up despite all the adversity she has had to overcome in her life. Scott endured much pain over the years — the loss of her mother when she was a teenager; a separation from an unfaithful husband; remarriage and the death of her new husband less than a year later; and a diagnosis of a mental disorder. But Scott said she is grateful for her faith and loving support from family and friends, and chooses to focus on the positive things in life. Born in Brownsville, Brooklyn, to a large Catholic, Puerto Rican family, Scott was the youngest of five children. She said she has fond memories of her childhood. “I remember in the summertime when it used to be too hot to be in the apartment, families used to sit outside until 3 in the morning on the weekends with their children, and it was very family-oriented,” she said. But all that changed when she was 16. Scott stayed in Puerto Rico for the summer and her mother went along. It was the first time her mother had visited the island in a long time. As her mother was helping Scott’s uncle move a stove, she sprained her back. When they returned to New York, Scott’s mother visited the doctor, who suspected lung cancer. Scott’s mother got a biopsy of her lung, but there were complications. Shortly afterward, she went into a coma. She died 13 days later. Scott’s life immediately turned upside down. “I always said that if my mother (had) still been alive, that my life would’ve been different,” she said. That same year, Scott met her first husband, Robert, the father of her four children. She applied for low-income housing and was accepted to live in the Tompkins Houses in Bedford-Stuyvesant, where she raised her three daughters and a son. Shortly after their son was born, her husband left the family, leaving Scott to raise four children alone. She discovered her husband had cheated on her, leading to her hospitalization in a psychiatric ward for 30 days. Scott, a Jehovah’s Witness, credits her religion for helping her survive. Although she was raised Catholic, Scott began practicing Islam when she was 14 and became a Jehovah’s Witness when she was pregnant with her second child 25 years ago. For Scott, living in Bedford-Stuyvesant has its ups and downs. She likes that she lives in a low-income, spacious, quality-made apartment. She also likes the close proximity to hospitals, shopping centers, public transportation and the Kingdom Hall of Jehovah’s Witnesses. What Scott doesn’t like about Bedford-Stuyvesant is the crime. Ginelle Williams, 20, said a few bad incidents taint a nice community. But Scott has no other choice but to stay. Five years after divorcing her first husband, Scott married her second husband, Lorenzo. In the same year, tragedy struck when Lorenzo complained about pain in his leg while he was playing basketball, caused by a blood-clotting disorder. Although his leg was amputated in January 1995, a blood clot reached his lungs and he had a pulmonary embolism and died on Oct. 2, 1995. His death was very difficult for Scott and her children. “First their father ups and leaves, and then here is someone else that came into their lives, and then he died,” Scott said. Scott experienced her second hospitalization after Lorenzo’s death. In 2000, Scott was diagnosed with bipolar disorder, a serious mental illness characterized by extreme highs and lows. Scott has been able to manage bipolar disorder now that she knows what she has. Scott was on disability for one year until recently; she now works with the Department of Education, a five-minute drive from home. Scott credits her faith, family, friends and music for keeping her positive.